Those of us in the Midwest have the blessing and curse of fescue. While it’s hardy (and invasive), it is also a cool-weather grass, meaning that it only grows during spring and fall, really. Cooler days of summer do it OK, but when you get into those dog-days of August, you get nearly nothing. Conventional grazing is to leave them in a pasture until they’ve eaten everything they want and it’s all pretty short. Then you move them into another one. And you’re keeping hay fields out of their reach so you can grow and cut hay for winter. We used to have them mostly on a single pasture and then feed hay from Nov 15 right up to April 15. 5 months out of the year. Gradually, we’ve been transitioning over to managed grazing. A couple of years back, I planted rye next to their winter pasture and fed them on this in the early spring. And I’ve been learning how to push them through the short spring growth and manage fields with only a small amount of old growth from the previous fall. The idea with managed grazing is to quit making hay – buy it instead. Put that acreage into rotation with the rest and move the cows every two or three days. You then come back in about a month, when it’s had a chance to re-grow. Ultra-high density stocking moves every day, but you bunch up the cattle into heavy concentrations and then rest that land for almost half a year before coming back to it. This is also called mob grazing. Managed grazing says to keep back some of your land so that you can stockpile the grass on it from about August on through November and the first hard freeze (for our part of the country). The idea is that you only have to feed hay when it’s too frozen and/or snow-covered for them to graze what’s out there. There are two general grazing principles to keep in mind; residual leaf cover, the take half, leave half rule, and second, provide a rest period until the plant is ready to be grazed again. Specifically, in the summer, do not graze pasture grasses below 4 inches in height. Keeping some leaf cover will result in quicker plant recovery after a grazing pass. The leaves will provide some shading of the soil, helping to keep the soil cooler and more conducive to cool season grass growth. Shading the soil from the sun will also conserve moisture, and provide better regrowth conditions. In the summer the rotation through pasture paddocks must slow down. Cool season grasses grow slower under summer temperatures. More time is needed for the grass to re-grow to grazing height after a grazing pass. Specifically, allow the pasture sward to regrow to an 8 to 10 inch height before entering a pasture paddock for another grazing pass. The application of these grazing principles requires an adequate number of pasture divisions or paddocks. What is an adequate number? In our beginning level grazing school we teach that the number of paddocks needed is determined by this formula: # of paddocks = Rest period/Grazing days + 1. The rest period during a typical summer can vary from 30 days in early summer or if temperatures do not exceed the mid 80's and some timely rains continue, to 45 or 50 days when temperatures are in the 90's and rains are few and far between. In the case of a drought, the required rest period can be 60 days plus. The amount of grazing days spent in the paddock depends upon several factors, including stocking density and grass regrowth. If stocking density is light, more days can be spent in a paddock, but there is a high amount of selective grazing and at some point desirable plants that are beginning to regrow can get grazed again. From a plant health and productivity standpoint, plants should not be grazed again as they begin growth following a grazing pass. So, grazing management will dictate that the time it takes a plant to begin active regrowth after being grazed determines the grazing days part of this formula. In the summer, it is generally accepted that plants do not begin active regrowth until about 4-5 days after a grazing pass. Of course, you can move over to native warm-season grasses, but these take more time to establish and don’t flourish in early spring when you want to put the most weight on your cattle, just before the peak auction prices in May-June. Now, mob grazing has an advantage over this, since when you keep them out, the thick mulch cows will trample and leave (they eat about 50% and trample the rest) will actually build in some water-holding capacity. So there are reports that farms using mob grazing don’t dry up even during droughts. However, that’s another day’s blog post. 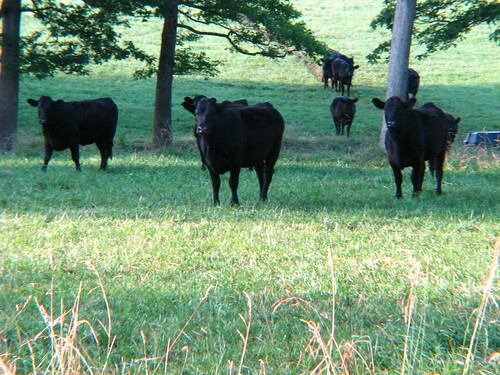 I’ve got some more stuff on mob grazing over at “A Midwest Journal”.